Following the trauma of the court challenge to Dobell's 1943 Archibald Prize winning portrait of Joshua Smith, the artist retreated to his family's holiday house at Wangi Wangi, on the shores of Lake Macquarie. This period of enforced retreat from Sydney and his preferred activity of portraiture, brought a new focus on the landscape. After a period of recovery, he began to work again, making small sketches of the lake foreshore and surroundings in pencil, watercolour and gouache, mainly from the terrace of the house or at a short distance from it. From these he developed several major paintings including 'Storm approaching Wangi'. 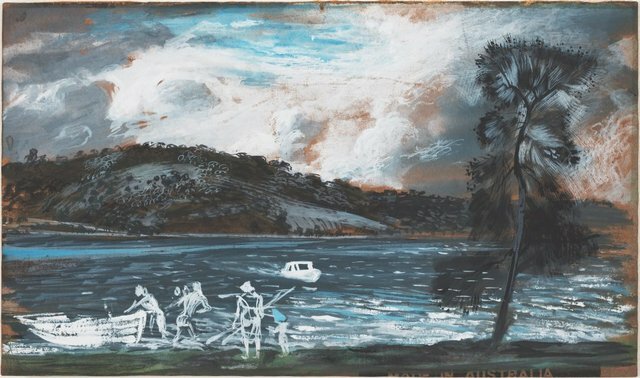 Dobell's 'Sketch for 'Storm approaching Wangi' evokes the drama of an impending storm that has whipped up white caps on the lake and prompted boating parties to seek shelter on shore. His thick impasto of white gouache captures the silvery quality of light at the scene, highlighting the building cloud, roiling water and figures labouring to bring a boat up the beach. The foreground figures have been identified as Dobell's neighbours Else and Jack Pendlebury, while the background boat belonged to another neighbour and close friend Norm Hilton. Gift of Robert Albert 2014.